Arnett writes that one must first understand Holley’s relationship with other musicians and genres that have influenced him throughout his life. When Holley was barely four years of age, his mother, a burlesque dancer, gave him over to the owner of a “whiskey house” in Birmingham, Alabama—an event that is often framed as Holley being traded for a bottle of whiskey. The whiskey house was located across a creek from the Alabama State Fairgrounds. Being in so close in proximity to the Fairgrounds gave Holley access to a wide range of musical genres: classical, jazz, and the contemporary music. What is more, the “centerpiece” of the whiskey house was a jukebox, where young Holley would fall asleep every night listening to the popular tunes of the time. All of these musical influences are apparent throughout the twelve tracks of MITH. Though defining Holley’s music using conventional genres seems to shortchange the artist, traces of blues, jazz, folk music, and spoken word are all simultaneously apparent. Similarly, the instrumentation throughout MITH is fairly diverse and varied: electric and acoustic piano, soprano saxophone, trombone, synthesizers, samples from the Thumbjam app, and of course vocals from Holley. What is even more apparent in this album is Holley’s experience growing up in the Deep South during the Civil Rights Movement. The songs are full socio-political and biting critique. For example, the fifth track simply reads “I Woke Up in a Fucked-Up America.” Other songs discuss the black experience in America by harkening it back to slavery. A verse from the opening track, “I’m a Suspect,” reads as follows: “I’m a suspect in America…Some of us been bound down and roped and tied/ And chained and shackled/ And pulling around iron bars…Sometimes appearing to be most wanted/ Then again, whoa, dead or alive/ When we arrive/ When we arrive/ To the point of being a dust speck.” Meanwhile, “I Snuck off the Slave Ship” paints a vivid, bloody picture of attempted escape and the lasting effects of slavery in the United States. 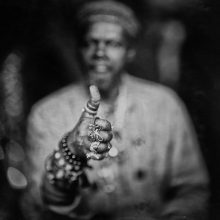 Perhaps then, when one sits down to listen to Lonnie Holley’s MITH, they should not expect to hear that he “adapted some of these influences,” but that he drew from all of them to create a sound that is unique to him. This entry was posted in Popular, Rock, and Misc. and tagged Alternative, CD review, Jagjaguwar, Kennedi Johnson, Lonnie Holley, MITH by aaamc. Bookmark the permalink.